Kiama – the name is actually derived from the ELO song ‘Kuiama’, although you’d be forgiven for thinking the band plucked it from a map of Australia – is nothing short of a seminal gathering of talent; and as you might expect, you can’t go far wrong with a quartet featuring Andy Edwards (IQ, Robert Plant, Frost), Luke Machin (Maschine, The Tangent), Rob Reed (Magenta, Kompendium) and Dylan Thompson (The Reasoning, Shadow Of The Sun). “We felt that there was no point in making music that sounded like our previous bands,” it says in the biography, and although there are elements of the members’ pasts in the nine songs on offer these have been distilled so that, while the essence remains, the overall flavour is as unique as it’s possible to be in today’s vibrant progressive music scene. 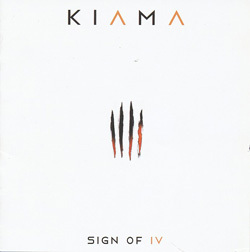 Even the album’s title, ‘Sign Of IV’, hints at the delivery of something special from such a renowned gathering of individual flair, and to be fair the album the four have created is pretty much flawless. One of its principal attractions is that it isn’t content to sit safe ‘n’ sound within pre-determined boundaries; nothing appears out-of-bounds in the Kiama songbook, and so, for example, they’re not afraid to get funky in ‘Cold Black Heart’ which with its dynamic keyboard fills makes for a lively opener, whereas ‘Beautiful World’ harks back to the heyday of Seventies’ progressive rock and could easily have graced any great album from that period. ‘Tears’ pretends to be brooding and morose but wraps up with a blistering attention-grabbing guitar solo, and ‘To The Edge’ nods to the heavy end of the spectrum but with jazzy little spritz in the mix. But that’s not to say ‘Sign Of IV’ suffers from an identity crisis. Taken as a whole –as any album should be – it’s an impressive body of work, linked by both Thompson’s striking vocals and the fact that the material is immaculate in both composition and execution. What’s not to like?